Difficult if the trail is so-mania. So, a while modification workshop Gandul 2Wheel Custom (G2WC) menyodorkan design Aprilia SMV 750, Helmy Hermansyah agree at Honda GL Pro Neo Tech own changed like that. Previously, residents who live in the complex marine copy Jaya Baru, Depok, this already have a Suzuki TS125 trail dirombak be RM125. 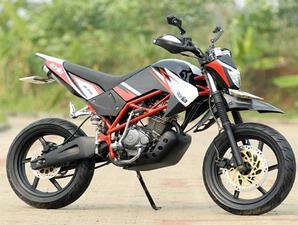 Wardoyo's claim to be given the freedom G2WC reorganize motor so SuperMoto and options that fit SMV 750. Although the concept is similar to diaplikasi not, he attempted to a similarity. Indeed, it looks like in the middle order which was formed from seamless pipe sizes 1 / 2 inches made intersect. "Sasis middle flank tank while the body is made of a sheet," said Wardoyo. According to him, the framework of this pipe is also made to sustain the back body (made from a plate integrates with sepatbor). To Suspensi, is part of the global trends with the monoshock system. Only, Wardoyo not follow the SMV model 750 is in the right order. Here, he put it exactly in the middle get comfortable because daily use. On the foot-feet, Wardoyo must work a little harder because the owners still want to use the default standard for the shock of the front. The solution, in order to display adapter iron plus high. Then, the middle be rubber shock Suzuki TS to better contain. Once the swing arm, at least more of the original thick. How, given the original plate using a condom. At the center of the trap are given arm that is similar to the Aprilia. The result, though without the components of waste, can also look.